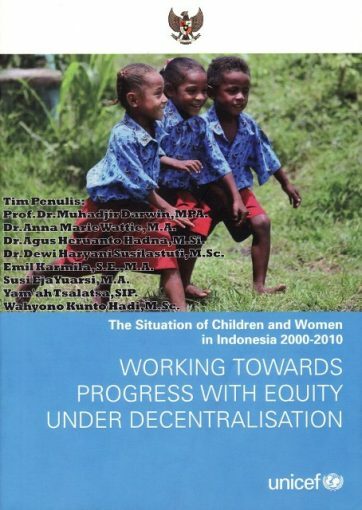 Within the overall context of Indonesia, this Situation Analysis for Children Report aims to identify, analyse, and explore the available data on the trends and patterns in the major problems affecting children and women in Indonesia over the past decade (2000-2010). It also aims to explore policy initiatives, innovations, and challenges in responding to these problems in the new decentralized government structures of Indonesia and to provide recommendations for policy makers and practitioners at the national and sub-national levels. The Situation Analysis demonstrates that the situation of children and women has been improving. For some indicators Indonesia is on the track to reach the MDGs by 2015 at the national level (for example in the case of universal primary education). However, the analysis also highlights that despite these improvements there are many disparities, such as geographic, economic, gender or income group discrepancies, requiring further urgent attention of the Government and its development partners. In particular, the Situation Analysis highlights the need 1) to reduce non-income poverty, 2) to redress socio-economic and regional disparities, 3) to improve the uneven capacity to deliver services at the district and provincial level, and 4) to better incorporate the needs and voices of children and women into local level decision-making.